Growing up I was not a particularly picky eater but there was one thing I really did not like: mushrooms. Yet every late summer when the golden chanterelles appeared in market stands in the nearby town my mom would cook chanterelle cream sauce and serve them with new potatoes from our garden. If me and my brothers chose not to eat them, well it was our own fault. Initially I would skip the sauce and eat the wonderful new potatoes with some cream or butter instead. Eventually I agreed to eating the sauce but made sure that it contains as little mushrooms as possible. And so, year by year, my plate would contain more and more chanterelles. I’m telling you, these golden beauties sneaked up on me and made me fall in love with them despite my best efforts to avoid them! A quick Internet search and some creative experimentation lead to this mouthwatering recipe. The ingredients above suffice for a dinner for two. Cut the bacon in small cubes, thinly slice the onion, clean and cut the chanterelles in smaller pieces. Put a large non-stick frying pan on medium heat and start with frying the bacon. You won’t need any frying oil or butter as the bacon provides plenty of fat by itself. Fry the bacon for a few minutes, add the chopped onion and continue frying until it is transparent and slightly golden. Add the chanterelles and continue frying for around 10 minutes. The mushrooms will produce quite a lot of liquid and it needs to evaporate. Once most of the liquid is cooked out, stir in the sour cream. Cook for a few minutes and adjust the thickness of the sauce. If you would like it to be more runny, add some boiled water until you achieve the desired consistence. Season with salt and pepper, add a generous hand of fresh dill. 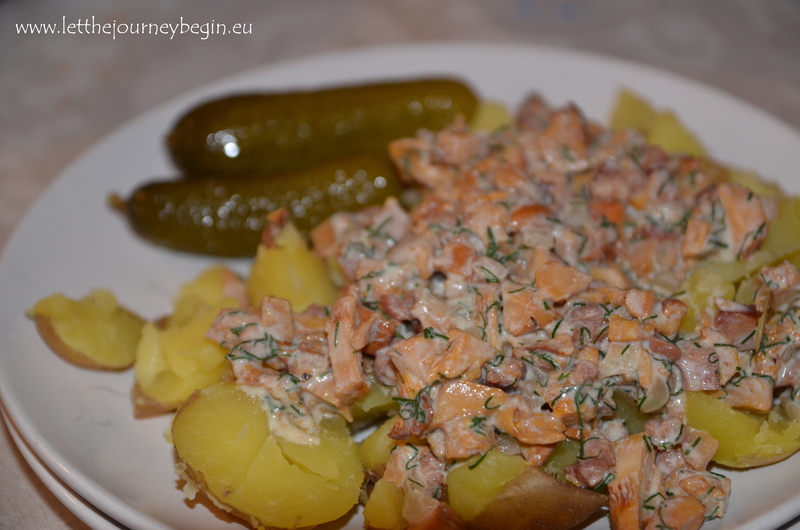 Serve with new potatoes and lightly marinated pickles. If bacon is not your thing, you can make the classic vegetarian version: simply skip the meat and replace sour cream with whipping cream (or similar). I have tried this recipe twice, once with cream and once with sour cream…sadly both without bacon as one daughter doesn’t eat pork! Both were delish, thanks!